We continue our exploration of the whisky vaults with another trio of sought-after bottlings, including one from long-closed Glenury Royal and others from a pair of very much still alive plants: Caol Ila and Glen Grant. Glenury Royal was another casualty of the 1980s slump in Scotch. It fell silent in 1983, shut for good two years later and was sold to a housing developer in 1993, ending its 160-year history. It owed its ‘Royal’ suffix to founder Captain Robert Barclay’s friendship with King William IV and, even among closed distilleries, remains a sought-after beast indeed, with two Rare Malts expressions and a couple of Special Releases bottlings. It produced a typically elegant, lightly smoky style of spirit, with a somewhat oily texture and a fragrant character. Everything about Caol Ila, from its secluded location to its historic role as a workhorse providing blending material, suggests a shy, unheralded distillery – at least, among its stellar Islay neighbours. Only in recent years has this most consistent of the island’s producers carved out its own niche among single malts, thanks to a regular range of smoky but balanced and easy-drinking distillery bottlings, plus the odd unpeated rarity. 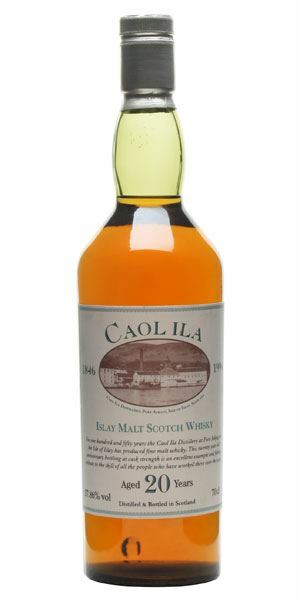 That said, this expression pre-dates Caol Ila’s recent rise to prominence, and marks the distillery’s 150th anniversary in 1996. 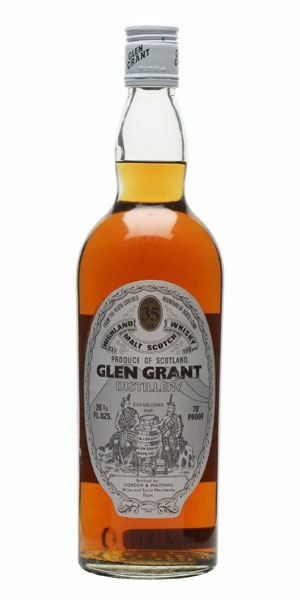 From its beginnings under brothers John and James Grant through the forward thinking of the younger John Grant, aka ‘The Major’, Glen Grant has been a distillery of substance – a brand of international renown before the word ‘brand’ was widely used. Modern Glen Grant has mainly been all about the pursuit of freshness and delicacy, in keeping with its huge success in the Italian market. 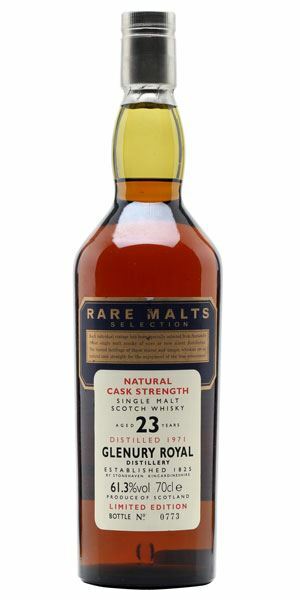 But older bottlings hint at a heavier, weightier style of brooding complexity and substance. Unusually for a Rare Malts bottling, this has a deep colour: polished copper/amber. The strength is high, but the whisky is so rich it doesn’t show. Rather, you notice a dense, stewing fruitiness with a delicate tropical edge. Then comes an iris-like note, Parma Violet, roasting corn and sweet leather. As it opens (and with a little water), there’s more animalic/amber notes. Given the lushness of the nose, this has a surprisingly dry and smoky start with some dusty tannins on show. All has settled by the mid-palate, where the concentrated fruits lurk. Water softens things down – maybe too much – bringing out mixed fruit compôte. Long and set, with a hint of smoke. Glenury Royal remains a rare sighting. This is one of the finest bottlings you’ll come across. A Parisian flâneur passes you by. You sniff his cologne. Distilled in 1976, bottled in 1996, this shows the usually gently restrained Ms Consistent of Islay in slightly bolder guise than usual. 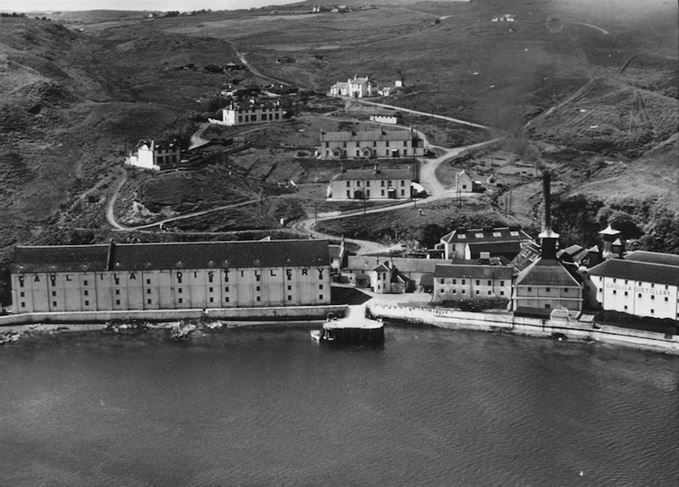 It was made two years after the expanded distillery came on stream. The first thing to emerge on the nose is linseed oil, then comes coastal smoke – that mix of brine and drying sea salt and a hint of Neoprene. In time there’s a light toffee note akin to Mars bars, then comes wet moss. When neat it’s seriously, mouth-coatingly, tongue-clingingly oily with just a little touch of mirabelle plum in there. All of the drive is given by these oils, rather than by the oak. Water rather marvellously disrupts all of this, making things considerably more boisterous, as if all the elements are fractured – here’s some pear and those yelow plums, there’s the brine, here’s subtle pigskin, over there a shard of lemon. It remains shoreline. A more thought-provoking Caol Ila than we normally encounter. A class act. A boatyard at Port Askaig. Someone is painting in the distance, someone closer by is treating their yacht to a coat of deck oil. Very deep amber. Oily and perfumed. A sumptuous, resinous nose which also contains luscious baked fruits, greengage jam and heavy, iris-like florals. Then a darker note like fresh tar develops. Astoundingly complex, with masses of whisky rancio, cooking cep mushrooms, moist forest earth and then pure old amontillado. Water makes it a lot drier and more phenolic. A lot drier than the nose suggests, with light tannins and a smoky edge. There’s liquorice, and this earthiness. A light and almost hollow start before the coal smoke begins to take charge. Water flattens – and dries – things. To be honest, it’s slightly disappointing after such a stunning nose. If you ever get the opportunity, inhale deeply. While walking deep into an old forest in the late autumn, you come across a dunnage warehouse. You enter. The doors shut behind you. All is darkness. Rare Batch 3 12/01/2016 Macallan, Springbank and Port Ellen all feature in our latest selection from the whisky vaults. Rare Batch 1 18/11/2015 Verdicts on a release from mothballed Convalmore, a cult Bowmore – and a Talisker Oddbins special.